Osheaga Music and Arts Festival Canada - 365 Festivals :: Everyday is a Festival! Are you looking for Dance Music Festival, with indie theme? 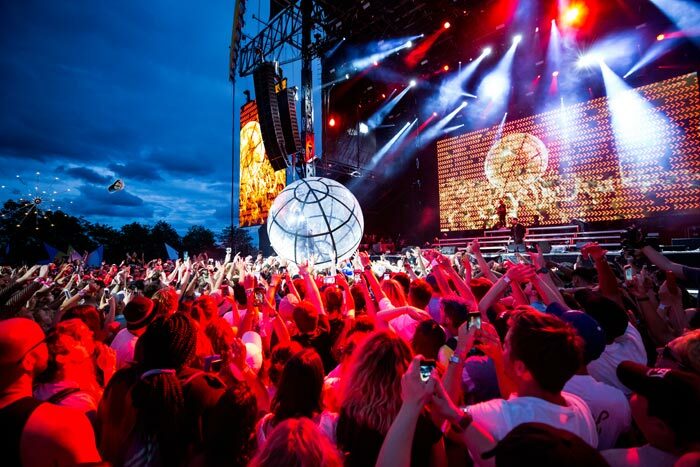 The Osheaga Music and Arts Festival situated in the historic city, Montreal, Canada. The Osheaga Music and Arts Festival is held every year for 3 days Parc Jean-Drapeau on Île Sainte-Hélène. The festival unlike others, has 6-stages namely "River Stage," "Mountain Stage," "Green Stage," "Trees Stage," "Valley Stage," and "Zone Picnik Electronik”. Osheaga Music and Arts Festival was inaugurated on Labour Day Weekend, September 2-3, 2006. The fest offers an array of quality, mid-level alternative bands. Osheaga organizers incorporated several Montreal-based bands including the Sam Roberts Band, Stars, Dumas, Sixtoo, Pawa Up First, Pony Up, the Royal Mountain Band, Sunday Sinners, and Pas Chic Chic. While Osheaga focuses greatly on indie acts and alternative music, the festival's lineup never fails to include massive mainstream headliners from genres like rock, hip hop, and pop. For its 12th annual Osheaga Music Festival will take place on August 3, 4 and 5, 2018. The list of artists anticipated to appear for 2018 Osheaga Music and Arts Festival includes: Post Malone, Odesza, Portugal. The Man, Alex Cameron, Smokepurpp, Sir Sly, Sylvan Esso, Rex Orange County, Manchester Orchestra, Milk & Bone and LP. The 2017 Edition of Osheaga Music Festival was an epic festival because there were major performers of the music industry. These Guys made everyone scream and made every penny spent for joining 450000 people WORTH IT! Muse, The Weeknd, and Lorde , Alabama Shakes, Justice, Solange, MGMT, Liam Gallagher, Broken Social Scene, Father John Misty, The Shins, Belle and Sebastian, Run the Jewels, Die Antwoord, Cage the Elephant, Tegan and Sara, Crystal Castles, De La Soul, Death From Above 1979, Local Natives, London Grammar, Nicolas Jaar, Danny Brown, Sampha, Angel Olsen, Little Dragon, Car Seat Headrest, BadBadNotGood, Noname, Cloud Nothings, Dawes, Strand of Oaks, PUP, Whitney, Hamilton Leithauser, Beach Slang, Swet Shop Boys, and The Districts. Also playing are Major Lazer, Foster the People, Vance Joy, Milky Chance, Phantogram, Glass Animals, Majid Jordan, Mick Jenkins, Lil Uzi Vert, Tove Lo, Flatbush Zombies, George Ezra, Foxygen, Maggie Rogers, SOHN, Nina Kraviz, Temples, The Lemon Twigs, Matoma, Bishop Briggs, Denzel Curry, Plants and Animals, Arkells, Sofi Tukker, and Andy Shauf. The 2016 Osheaga festival, there were phenomenal performances by artists like Red Hot Chili Peppers, Lana Del Rey, Radiohead, Death Cab for Cutie, M83, Future, Haim, Disclosure, The Lumineers, Grimes, Bastille, Flume, Passenger, Leon Bridges, Bloc Party, Mac Miller, The Arcs, Cypress Hill, Foals, Nathaniel Rateliff and the Night Sweats, Wolf Parade, Daughter, Elle King, Years and Years, Logic, St. Lucia, Oh Wonder, Vince Staples, Keys N Krates, and many more. The Osheaga Music and Arts Festival is definitely an event that every music lover should check out. Whether you are more excited to see performances by smaller indie acts or by the world-famous headliners, you shouldn't miss out on this chance to attend the 2018 Osheaga Music and Arts Festival in Montreal. So come and join in on the fun of one of the best music events in North America, get your Osheaga Music and Arts Festival tickets today.